The search for meaning in Islamic art is of enduring interest. This book explores the iconography of Islamic art and presents a diverse range of approaches. Despite this variety, there is an overarching theme—the linking of the interpretation of objects to textual sources. This results in a collection of in-depth studies of motifs as diverse as the peacock, trees, and the figure holding a cup and branch. In addition, new interpretations are presented of other objects, such as an Ayyubid metal basin or Mongol paintings. Textual sources on the Ka’ba or the use of marble provide a starting point for the examination of objects and their relationship to history. The architectural decoration of monuments from Egypt to India is analysed, and Arab and Safavid paintings are mined for meaning. Links with Christian elements in Sicily or Buddhist stupas are appraised. Professor Robert Hillenbrand’s writings on Islamic art and architecture cover an enormous range, from the seventh to the nineteenth centuries, and from Spain to India. 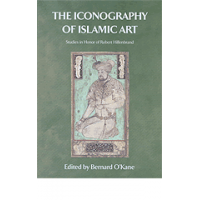 The multiplicity of approaches to the search for meaning in Islamic art found in this book mirrors the broad range of his scholarship. Lavishly illustrated throughout, with color and black-and-white photographs and line-drawings Contributors: Sylvia Auld, Marianne Barrucand, Sheila S. Blair, Jonathan M. Bloom, Barbara Brend, Anna Contadini, Abbas Daneshvari, Geza Fehervari, Barbara Finster, Finbarr Barry Flood, Oleg Grabar, Ulrike al-Khamis, Marcus Milwright, Bernard O’Kane, B. W. Robinson, Avinoam Shalem, Raya Y. Shani, Rachel Ward.